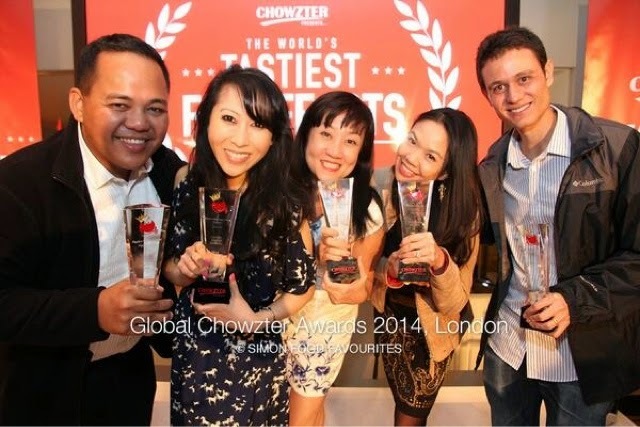 The inaugural Chowzter Awards held at L'Anima in London saw almost 50 food writers/bloggers converging from around the world. Each one is a Chief Chowzter representing their own city - Chowzter.com now has more than 90 of these recommending the best places to eat locally - and the awards highlight the best picks of the year. I love this picture by Sydney blogger Simon Leong (@simonleong). Here are Anton Diaz (@antondiaz) for Manila, Mijune Pak (@followmefoodie) for Vancouver, myself for Singapore, Juliana Loh (@bilbaobab) for Hong Kong, and Mark Wiens (@migrationology) for Bangkok. Bangkok was also voted Foodiest City in the World 2014 (Singapore was one of the five nominees). The 60 nominations for the awards were all mouth-watering choices. Asian food actually swept quite a few of the trophies, at least five out of the 16. 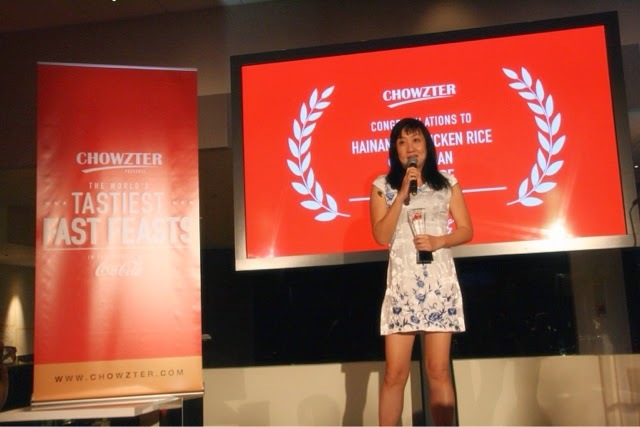 Tian Tian Hainanese Chicken Rice win Best Rice Dish. I was quite surprised! We also had Alaskan King Crab Five Ways at Dynasty Restaurant in Vancouver for Best Seafood. Pad Thai Thip Samai in Bangkok won Best Noodles 2014. The Roast Goose at Yat Lok in Hong Kong was Best Bird. Asia's Tastiest Item was the stuffed lechon from Pepita's Kitchen in Manila. And Tastiest dish on earth for 2014 was Javier Wong's ceviche in Lima, Peru. This old grandmaster of ceviche at Chez Wong reminds me of Jiro, the way he works artfully with simple ingredients to produce something so delicious. Welll, Chowzter.com is still very new - it's only one year old - but things are looking great with the synergy from the smart and lively folks all united in our one passion for food. I can't wait to see how the site will grow and what happens next year.